The moderate climate of Mizoram, comfortable even in summer, makes it a comfortable destination for all the tourists whereas the vast culture and grand festivals od the state have a unique irresistible charm which can not be explained, said or read, it can only be felt once you are in there in the peaceful, serene land of Mizoram surropunded by green forests adn high hills taking you to a different world. Mizoram offers you a calm, serene atmosphere with exciting outdoor activities in the beautiful lush green surroundings which keeps you close to the peaceful nature. With grand festivals, happy people wearing colourful traditional costumes Mizoram welcomes you to explore its beauty and richness. There are plenty of sightseeing options to enhance your travel while the location itself is a sight to behold. Don't forget to stop by a tribal craftsman to get amazed by their unique talent and pick a traditional shawl for yourself as a memory of the trip. For non-vegetarian people, the food of the state will be a real treat while vegetarians will have to choose carefully from the dishes. If you love to be in nature's arms, then Mizoram is the place for you as the moderate climate which does not go up even in summer makes the trip a pleasant experience. The beauty of the state is so mesmerising that it cannot be explained. It can only be felt once you are there to behold it yourself and the picturesque view remains alive till you go back to explore it once again. Picturesque landscapes. Balmy weather almost throughout the year. Under-developed infrastructure. Might face transportation problems since there is only one airport in the state in Aizwal. Also, getting a public transport in late evening is difficult since the state usually shuts down by 6:00 PM. All the festivals of the state are celebrated with great fervour. The Chapchur Kut festival which is held in March is a gala event. This festival is related to harvesting, and all the people gather wearing traditional clothes to celebrate. Cheraw and Bamboo dance forms are also performed. Mim Kut is a religious festival which is celebrated in August and September to pay respect to the people who died in the previous year by offering bread, maize, vegetables and other items. Dancing and singing are also included in this festival. Pawl Kut is another famous festival of Mizoram. In this two-day event, people perform thanksgiving after the completion of harvesting activities. Anthuriam Festival held in the month of September is primarily celebrated to promote tourism. Dance, music, games, archery, shooting and other exciting activities are a part of this festival. Puran is the favourite dress of women. During festivals, Puanchei dress is worn by women which have a combination of white and black shades. Kawrchei is a beautiful blouse woven by hand and is worn with Paunchei while dancing. Females of the great Lusei tribe wear a blue cotton skirt with a jacket and a wrapped cloth. Mizoram men like to keep their clothing simple. They just wear a long piece of fabric, and during winters, they wrap around an additional cloth. They wear a combination of red and white colours. Mizoram offers a variety of adventures which will surely give you an adrenaline rush. Trekking in Champai, Lunglei town and Phawangpui peak is a great option. The Blue Mountain Peak is famous amongst mountaineers. Besides this, there are other peaks for rock climbers. Tourists can also explore the caves of Mizoram. For caving, the most famous caves are Pukzing Cave and Lamsial Cave. Since many lakes and streams pass through Mizoram, the state offers exciting water sports like angling and boating. Palak Lake, Tamdil Lake, Rengdil Lake and many others are a good option for water sports. Mizoram has one and only airport named as Lengpui Airport which is situated at Aizwal, the capital of the state. The airport is well-connected through daily flights to Guwahati, Kolkata and Imphal. It is located at around 32 km from Aizwal. Airlines like Jet Airways, Spice Jet and Air India run on this route. The airport is domestic and therefore does not cater to international cities. Since there is only one airport in the entire state, you might face some transportation hassles. Indians need an Inner Line Permit (ILP) to enter the state. The cost is INR 170 for a 15-day permit. The process to get an extension is slightly difficult. One can get an ILP documentation done at the Lengpui Airport in Aizwal. Mizoram's history goes back to 16th century when the Mizo Tribes crossed the Chinese border. During the 18th and 19th century, the area witnessed numerous tribal wars, and in 1898, the region came under the British rule. Mizoram's first political party was the Mizo Common People's Union, formed in 1946. After the independence in 1947, the Bordoloi Committee was set up to advice on the tribal affairs of the north east. However, demand for a separate state was raised, and in 1955, a new political outfit - the Eastern Indian Union was founded. After many years of protests, Mizoram was recognised as a full-fledged state of the country in 1987. Mizoram is a fascinating land of vast mountains and hills. The rivers and streams running through them add to the beauty of the state. The tallest of the hills is the Phawngpui or Blue Mountain with a height of around 2210 metres. The northern part of the state comprises of important rivers like Tlawng, Sonai, Dhaleshwari. Rivers like Mat, Tyao, Tuipui and Tuichang run through the south of the state. The picturesque lakes like Palak Lake, Tamdil or Rungdil Lake attract tourists from all over the world. 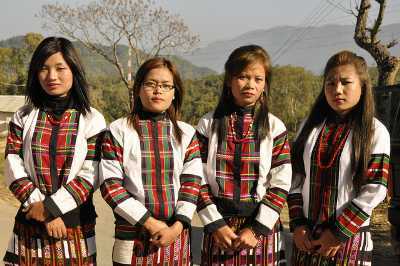 Mizoram is inhabityed by tribal people who are humble, friendly and creative. Most people speak in English besides Mizo. Christianity is the major relegion of people and they celebrate all the religious as well as Anglican festivals such as Christmas, New Year's Eve, Boxing Day and Easter. There are margnal number of people who follow Islam and Hinduism. The tribes are very hospitable as they not only welcome tourists with a smile on their faces but they also dance and sing to entertain their guests. The traditional crafts of Mizoram are weaving and cane and bamboo work. The Mizo women weave intricate traditional designs on their looms. The shawls woven by the tribal people are as beautiful and crafty as the state itself. Cheraw, Khuallam, Chheih lam and Solakar or Sarlamkai are the dances of the state. Mizoram's cuisine is mild, zesty and tinted with influences of North Indian and Chinese cuisines. Like in most of the North-East regions, rice is staple and usually goes with a non-vegetarian preparation, usually fish, with fresh, local and seasonal vegetables.